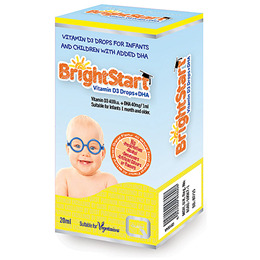 Quest Brightstart Vitamin D3 400iu + DHA - 20ml Drops combine two essential nutrients in one convenient formula for infants and children aged between one month and five years old. Vitamin D is an essential vitamin for children as it contributes to the growth and development of bones. The UK Department of Health recommends that all infants and young children aged 6 months to 5 years should take a vitamin D supplement. Vitamin D also helps to maintain teeth and contributes to the normal function of the immune system and muscles. DHA contributes to normal brain function and maintenance of normal vision. This beneficial effect many be obtained with a minimum daily intake of 250mg of DHA. BrightStart Vitamin D3 and DHA drops are part of the Quest Platinum Excellence range of nutritional supplements providing potent innovative products of the highest quality designed for specific health needs. Quest Platinum Excellence products are backed by scientific research and are produced from high quality raw materials using industry leading manufacturing standards and techniques. Sunflower Oil, DHA algal oil (ulkenia sp. ), vitamin E (dl-alpha tocopherol acetate), Vitamin A palmitate (letinyl palmitate), vitamin D3 (cholecalciferol), Natural orange flavour. Take 0.5ml twice a day or 1ml once a day. Not suitable for infants consuming 500ml or more of formula milk a day and infants under one month of age unless under medical supervision. Not suitable for infants consuming 500ml or more of formula milk a day and infants under one month of age unless under medical supervision. 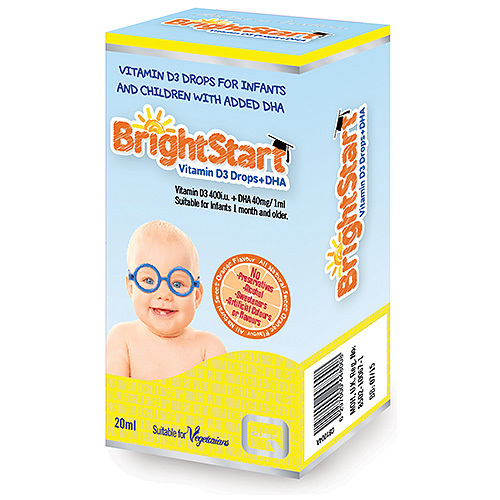 Do not take any other products containing vitamin D and vitamin A together with BrightStart D3 + DHA drops. Below are reviews of Brightstart Vitamin D3 400iu + DHA - 20ml Drops - Best before date is 30th June 2019 by bodykind customers. If you have tried this product we'd love to hear what you think so please leave a review.